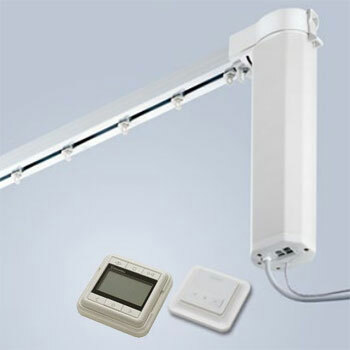 Made to Measure, Full Electric Curtain Track Kit with a Wireless Wall Button & Programmable Timer. Just Add Curtains. No Electrician Required. This Silent Gliss Autoglide 5100 T electric curtain track is easy to fit and designed especially for use in the home. It is a complete kit with everything you need to automate your curtains (you just need the screws or fixings for the type of wall or ceiling you're fitting to, plus standard curtain hooks for your curtains). This model is operated by an included Programmable Timer and Wireless Wall Switch, effortlessly opening and closing your curtains for you.